We are proud to once again partner with our hometown baseball team, the Potomac Nationals, to bring you the Loyal Hygiene Solutions Fan Choice Bobblehead! This bobblehead will be voted on by the fans of the Red, White, and Blue and we need your help in coming up with ideas. Submit your idea(s) for a 2017 Potomac Nationals bobblehead by either messaging P-Nats on Facebook or Instagram (@PNats42), tweeting (@PNats42), or e-mailing adeegan@potomacnationals.com. If your bobblehead idea wins, you will receive four reserved tickets to the fan choice bobblehead game (date to be determined), as well as the bobblehead in the ticket office, without having to wait in line. In your submission please include your full name, and the best way to get in contact with you. You can simply provide the bobblehead idea(s) or you can also include an artistic rendering, photograph, or collage of how you would like the finished product to look. 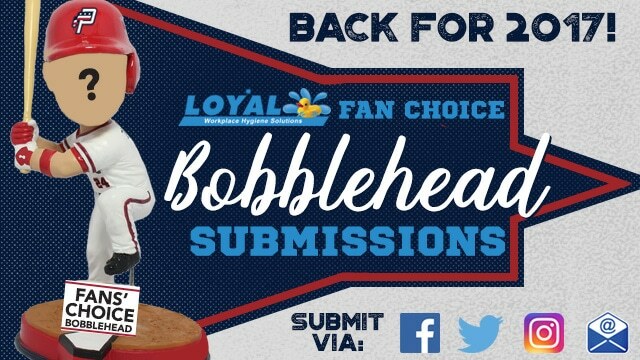 The Potomac Nationals will review all fan submissions and then compile a lineup of the best, most creative fan-crafted bobbles to present back to the P-Nats’ fans for a P-Nats Loyal Hygiene Solutions Fans’ Choice Bobblehead Final Vote. Voting will take place on the P-Nats’ official website poll all the way up to the date of the to-be-announced 2017 Potomac Nationals Hot Stove Banquet & Silent Auction held in the New Year, where the winner will be announced. Loyal focuses on providing a personalized approach to business. We are committed to providing outstanding customer service 7 days a week, 365 days a year. Simply put, we’re there for you when you need us. Copyright 2019 by Loyal Hygiene Solutions.